Water is essential for temperature control, waste excretion, electrolyte balance, digestion and more. Fresh, clean water should be available at all times, especially for pregnant and nursing does. Water is essential to bucks and wethers for proper maintenance of their urinary tracts. Place water containers in the shade if possible. Algae grows like crazy in water that receives direct sun. Keep water troughs clean. Dirty water leads to illness, and clean water will encourage water consumption. Goats will not drink water contaminated with urine or manure (including that from dogs, cats or birds). 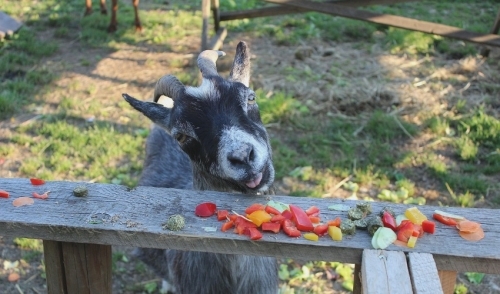 Add ice blocks to your goats’ water during extreme heat or if you will be away for long periods. If using small individual water containers, change drinking water several times a day in hot weather. Inadequate water consumption can result in concentrated urine, which can increase the risk of urinary calculi, especially in hot weather. (Urinary calculi occurs when stones form in the urinary tract and block the urethra, interfering with urination.) Increase water intake by offering free choice salt. This will help dilute the urine. Building ventilation is a must in hot weather. Cross ventilation, which brings in fresh air and removes stale air and odors, is preferred. Goats don’t need luxurious accommodations, but they need more than a stuffy shed to protect them from sun or rain. Goats hate rain and mud. A dirt floor is okay as long as it’s clean and dry, but a raised, slotted floor is even better. A dirty shed with dirty bedding is an invitation to skin sores, mastitis, respiratory ailments, foot problems and more. These problems escalate in summer, so keep your goats’ shelter immaculate. Diarrhea can quickly lead to dehydration in summer heat. Keep cool, clean water available at all times. Persistent diarrhea in young kids can lead to death if left untreated. Consult your veterinarian. Shear longhaired goats before summer heat sets in. Goats are playful and inquisitive, always looking for something to do. A raised platform in the pasture (preferably in shade) can be a great place for goats to play. - build in plenty of time to rest, water and feed them along the way.